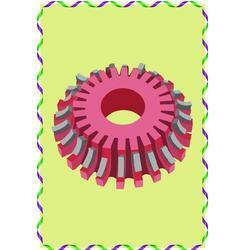 A sprocket is a profiled wheel with teeth that meshes with a chain, track or other perforated or indented material. It is distinguished from a gear in that sprockets are never meshed together directly, and differs from a pulley in that sprockets have teeth and pulleys are smooth. We are a manufacturer and supplier of Profile Wheels in India. Profile wheel are designed for profiling hard stone materials. We are offering a wide range of Stone Profile Wheel. These are manufacture by high quality of raw material. These products are available in various sizes to suit various requirements of our customers. Customers can avail these products at very competitive and affordable prices. 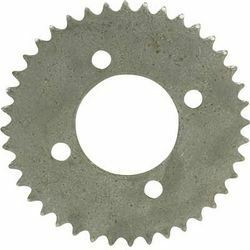 A sprocket is a profiled wheel with teeth that meshes with a chain.Sprockets are used in bicycles, motorcycles, cars, tanks, and other machinery either to transmit rotary motion between two shafts where gears are unsuitable or to impart linear motion to a track, tape etc..
A sprocket is a profiled wheel with teeth that meshes with a chain, track or other perforated or indented material. It is distinguished from a gear in that sprockets are never meshed together directly, and differs from a pulley in that sprockets have teeth and pulleys are smooth. We offer high quality Industrial Sprockets.